So, lets say that you are a code genius. You understand what is going on under the hood. The developers of your application have shared intimate details, not only of their bar crawl, but of what each object is in the application. What can you do with this knowledge? Rapise automatically will select the best it for recognition in an application. We all understand that. But what if your development team decided to try out something embedded? A different technology that the rest of the application. How can you override the decision Rapise has made and force it to use a recognition technology other that that which was auto recognized? You can use specialized learning! Begin your learning process as normal. Choose your application under test, and learn the other objects. This learning can be any of the other types of learning, through doing, selecting objects, simulated objects, etc…. Once you arrive at the object that is resisting your learning process, AND, that you have deep knowledge of its background, you can select the learning method to be used. In the activity window you will see a drop-down between the Analog button and the Cancel button. Use the drop down to select amongst all the available technologies for learning. Select based on the technology and type of object. 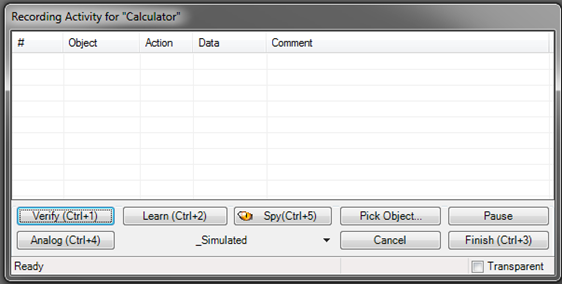 Once you have made this selection click on the name portion of the drop-down to activate that type of learn, and then select the object in the screen. In the background, Rapise will attach the technology and type definition files and call them as a part of your test. When you execute the test the same thing happens, Rapise will make use of the other technology definition files to identify, and interact with, the alternate technology when called to do so. This shouldn't come up often as many organizations have tightly defined technology profiles used in development, but id does happen. Seeing an outside technology inserted into an application is typically a sign of a developer cowboy, or a lack of definition in the requirements phase.